Part of the Penn State Romance Studies series. 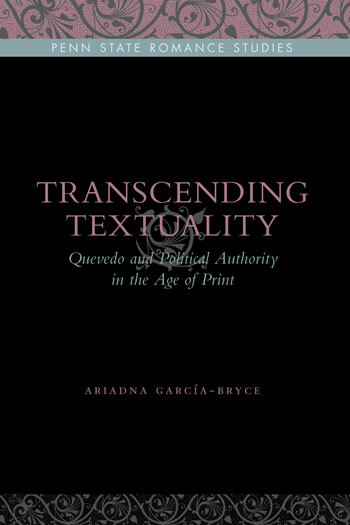 In Transcending Textuality, Ariadna García-Bryce provides a fresh look at post-Trent political culture and Francisco de Quevedo’s place within it by examining his works in relation to two potentially rival means of transmitting authority: spectacle and print. Quevedo’s highly theatrical conceptions of power are identified with court ceremony, devotional ritual, monarchical and spiritual imagery, and religious and classical oratory. At the same time, his investment in physical and emotional display is shown to be fraught with concern about the decline of body-centered modes of propagating authority in the increasingly impersonalized world of print. Transcending Textuality shows that Quevedo’s poetics are, in great measure, defined by the attempt to retain in writing the qualities of live physical display.